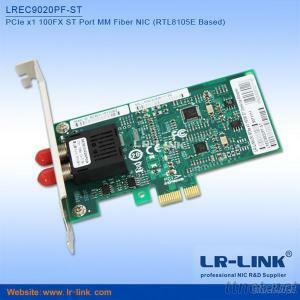 LREC9020PF-ST is a pci-e bus 100Mbps fiber network card adapter developed by Shenzhen Lianrui Electronics CO.,LTD. With 1x9 optical transceiver module, it can be matched with different fiber connector or optical transceiver module with different transmission distance according to the requirement of users. The network card can offer users reliable fiber-optic link on fast Ethernet internet , particularly it is fit for places where distance of accessing to POI beyond string Cat 5e (>100m).It can completely replace the networking structure of that Ethernet card with RJ45 port connects externally optical transceiver .It can provide users with reliable FTTH and FTTD solutions .Users can select the optical interface parameters (including connectors, single-mode / multi-mode fiber, working distance, etc) according to occasion. PS: The above details are just for reference, if there are any changes, no prior notice.